Do you think the current melting in the Arctic and Antarctic poses future problems for Earth? A new Antarctic project will drill into the frozen southern continent to uncover its climate secrets. Although Earths ice is largely isolated at its poles, the planet is technically in an ice age  a condition that Earth has experienced in different ways many times throughout its history. 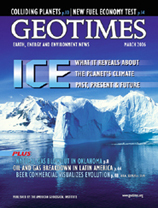 Geotimes talks with a glaciologist who travels the world in search of ice and its past. Earths northern latitudes provide early warning for global climate change. Changing temperatures could change when and how much water from mountains is available for the worlds drinking supply. New models are revealing the conditions that sank a legendary Great Lakes freighter and in the process teaching students about weather. Evolutionary biology is pivotal to scientists who are fighting to prevent disease. U.S. policy-makers are trying to spur the country into another Sputnik moment, of rapid advancement in basic research and development. Oh, what a difference 100 years makes for intrepid Antarctic explorers communicating with the outside world. Congress establishes a national geological survey to promote exploration and development in the western United States. Icebergs float near Danco Island off Antarctica, a continent that holds 65 percent of the world’s freshwater. 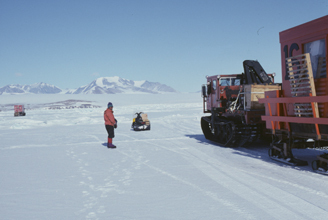 The Antarctic and the Arctic regions serve as important natural laboratories in understanding past climate change and possible future changes. Photo is by Michael Collier.